Product code: W1084 Categories: Omega Watches, Watches. Here is a very rare solid 18ct gold Omega Constellation model 368.0847 that was made in 1972 and is destined to always get the attention that it deserves. The Omega Constellation series of watches always use the highest chronometer grade movements and inside this one is a brilliant 23 jewelled automatic Omega calibre 1011 that has been completely serviced, runs perfectly and comes with our twelve month warranty. The band fitted onto the watch was actually the first in the world to be truly integrated into the watch case. This was another innovation by Omega as well as the wonderful Retro “TV” screen dial. Nearly all watches with yellow coloured dials is made on steel that has been coloured, whereas the dial itself on this Omega is solid 18ct gold. So not only is the case and band solid 18ct gold, but so is the dial and being gold it gives it such a rich colour to it that of course matches perfectly with the case and band. This is such a solid and hefty watch that is not only in brilliant condition but feels incredible on the wrist and is one Omega Constellation model that is so hard to find. 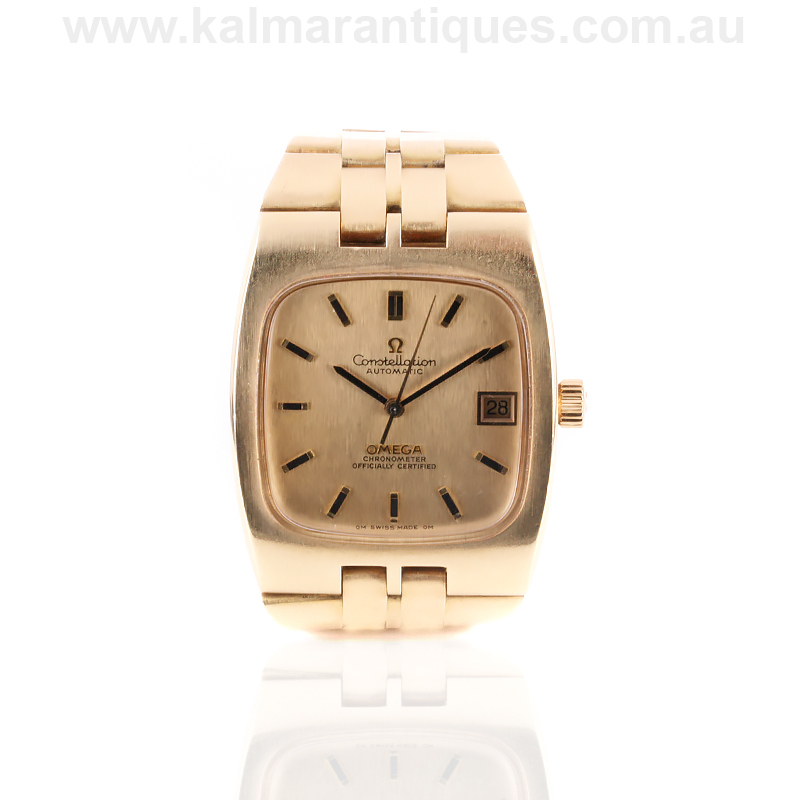 Tag: 18ct gold Omega Constellation watch. In astronomy, the term constellation refers to a group of stars whose movement through the celestial vault is consistent and predictable. What better name could there be for a line of watches whose name became synonymous with the world’s chronometers? In watchmaking, the name Constellation has been closely linked with the art of creating luxurious precision watches at the highest level since 1952, when Omega launched the family. It has always been defined by the combination of sumptuous yet elegantly refined cases and dials with ultra-precise movements. The symbol of this line was to be the Cupola of the Geneva Observatory, where Omega had just reset its own record for precision in 1951, surrounded by eight stars representing its greatest chronometric achievements at the world’s observatories including the 1931 “clean sweep” at the Observatory of Geneva where Omega broke the record for precision in every category. The progenitor of the Constellation line is without doubt the appropriately named “Century”, a limited edition self-winding chronometer wristwatch launched in 1948 to celebrate the firm’s 100th anniversary. This watch, not intended for series production, was greeted with such enthusiasm that the decision was taken to create a watch with all the same qualities on an industrial scale. It started with the movements, which were all self-winding chronometers that had received the mention of “Especially good results” during testing. The line would soon develop into a series of watches which were finished to different degrees. The Constellation available in steel or gold, the Constellation Deluxe only available in gold with applied gold indexes on the dial and finally the Constellation Grand Luxe, which was available in gold and platinum with corresponding dial and the so-called “Brick link” bracelet. The Grand Luxe model was delivered in a solid silver presentation box. In the United States this line of watches was at first known as the Globemaster due to a trademark conflict which was resolved in 1956. Many of these watches simply have the Constellation star on the dial. Later OMEGA’s American agent would produce a line of lower quality watches under the “Globemaster” name. In 1958 the Constellation line was further expanded with the Constellation Calendar. It was available in the three different levels of finish from standard to Grand Luxe. At the same time the Constellation was advertised as being “For the man who already has a watch”, an allusion to the fact that a Constellation was so much more. This period would see much diversification in the form of the Constellation line including square watches and many pavé diamond models. Probably the most significant would be the “Integral” line launched in 1969 based on a 1965 patent, whose hand-finished bracelet and case were integrated, thus forming a consistent and flowing design from one element to the other and back again. This form of integration would soon be adopted by many other brands and has become one of the main features of the luxury sports watch. 2012 marks the 60th anniversary of this line which continues to set the standard for luxury watches and remains, as its original advertising claimed, for those “who want the finest watch that man can make”.